Has the bank asked you for an explanation letter? This is common if you’ve found yourself apply for a home loan with credit issues or maybe you’ve moved address or accidentally forgot to pay for a phone bill. Either way, there are a few ways to work this out, you’ll just need to be prepared with evidence and a good explanation. In general, banks look for a letter to explain the circumstance for those who have had missed payments on current debt, or bankruptcy, defaults and judgements against their credit file. So to get you moving with this process, we’ve compiled some letters as templates for you to use when explaining your reason for defaulting and how you rectified it. Australian lenders have strict requirements for letters explaining any credit problems you may have. Download the explanation template here. ✅ Contain your full name and address. ✅ Explain what happened in as much detail as possible. ✅ Provide any evidence that supports why you defaulted on the credit facility including receipts, letters, insurance policies and contracts (only send copies so you can hold onto the originals). ✅ Include a sentence confirming that you understand how serious the credit problem was and intend never to get into that situation again. Usually, an email or faxed copy is accepted however some will require your mortgage broker to have a copy of the original file. 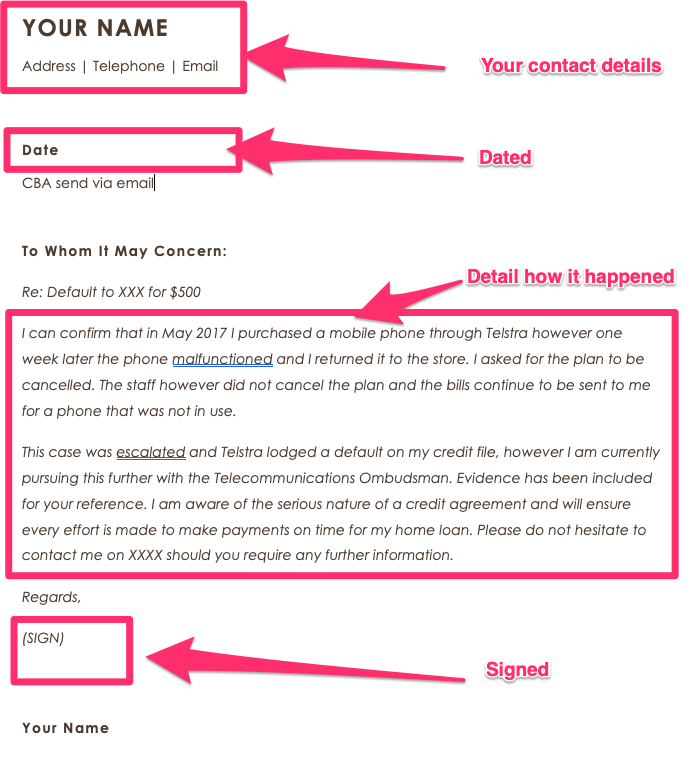 I can confirm that in May 2017 I purchased a mobile phone through Telstra however one week later the phone malfunctioned and I returned it to the store. I asked for the plan to be cancelled. The staff however did not cancel the plan and the bills continue to be sent to me for a phone that was not in use. This case was escalated and Telstra lodged a default on my credit file, however I am currently pursuing this further with the Telecommunications Ombudsman. Evidence has been included for your reference. I am aware of the serious nature of a credit agreement and will ensure every effort is made to make payments on time for my home loan. Please do not hesitate to contact me on XXXX should you require any further information. Chat to Hunter Galloway for further support about writing a letter to the bank. In order to make a successful application, you need to adhere to the bank’s guidelines for the letters otherwise your loan could be declined by the bank. It’s not uncommon to have issues with businesses the bank might pick up as a part of the application process, it could even be as simple as explaining a current directorship you have is for a hobby business or something that is a side business and that you aren’t reliant on that income. My wife and I had a small business that was part of a larger franchise group. In 2016 the large franchise group went into liquidation and as a result we were forced out of business. After this due to the cost of setting up the business we were left with numerous debts, however we have now returned to our previous jobs and repaid the debts. This experience unfortunately has left defaults on our credit file. Shared houses can be great, they allow you to split bills and expenses with everyone living there but the downside is that you might leave someone responsible for a bill and they forget to pay it… Meaning you get hit with an electricity provider default and could cause headaches when applying for a home loan. In 2016 I was living in a share house with two other flatmates and the lease and utilities were under all of our names. Later that year I moved out of the property but I was unaware that I was still liable for the utility bills. I tried to apply for a credit card and was knocked back due to a default on my credit file. It was only then that I found out that my previous housemate had not paid the electricity bill. An unemployment letter explanation letter is less common than the others but could be used to explain to the bank a gap in your employment history and the reason for it. This is quite a common reason loans get declined by various banks. I was living in a country town that heavily relied on the mining industry. The local mine closed which had disastrous effects on the entire towns economy which caused me to lose my job. I was unable to find work in the town for over 6 months and despite my best efforts a default was lodged on my credit file. I have since moved to a major city, have stable employment and have paid my outstanding bills. Again this is a less common explanation letter but could be required for situations to explain why home loan or electricity bill repayments were missed even though you were still fully employed. My wife and I divorced in early 2016 and I was left with the children. I moved back in with my parents until I could find somewhere for us to live. During this time all of our bills were being sent to our previous address and my ex-wife did not pay them. Moving overseas is a common reason we see for people falling into default on telephone and electricity bills, as they might forget to set up mail forwarding and never know they even owed the money! Fortunately, you can use this letter template below to explain your situation and how the problem occurred. In 2014 I moved to Europe for a working holiday for two years. Prior leaving, I informed my credit card provider of my departure and asked them to mail my statements to my parents address. However for some reason my address was never changed by the provider and they couldn’t contact me so a “clear out” default was lodged on my file. Upon my return home I found our about the unpaid bill and got into contact with them to pay it immediately. This is another unfortunate situation where you might have moved house, and forgotten to get your mail forwarded and as a consequence has fallen into default with your provider. Not to worry, fill out this letter and we can look at what home loan options you have. Due to renting, I moved house in 2016 and informed my internet and phone bill providers of this. For some reason the transfer was not completed and they continued sending bills to my previous address. After some time of the account being unpaid they lodged a default on my credit file without notifying me. ✅ Take responsibility: Don’t blame anyone else or the creditor for your mistakes as this can really reflect badly on your character. ✅ If you were innocent: If it was a mistake, describe what steps you took to rectify the situation including all correspondence with relevant parties in a clear and succinct manner. ✅ Explain what steps you’ll take: Be clear that you don’t intend to get into a similar situation again but also how you plan to do that, it can work in favour of your application. Lenders will try and understand if the problem was your fault or not, however, if it was your fault don’t expect the lenders to be on your side and support you unless you can give them a strong reason to see that you’re not a high-risk customer. Good reasons for a default include illness, marriage breakdown, being overseas or a dispute with your utility provider. Bad reasons for a default include an unwillingness to pay, loss of job, bad money management and spite. Without evidence, you’re going to find it very hard to win the lenders over and back up your story. For divorcees – can you provide a letter from your solicitor? Or if you were travelling have you got a copy of your visa? All of this evidence will help form your case and make it clear to the lender about how you’re currently trying to resolve the situation. Speak to Hunter Galloway about writing your credit history letter and home loan options today. We are experts in getting home loans approved, and work with several banks that specialise in helping first home buyers. If you would like to chat about buying a home and need finance, speak with one of our experienced mortgage brokers to walk through the next steps with you. At Hunter Galloway we help home buyers get ahead in this competitive market and we give you the actual strategies that have helped other home buyers like you secure a property when there have been 5 other offers on the table! Enquire online or give us a call on 1300 088 065.